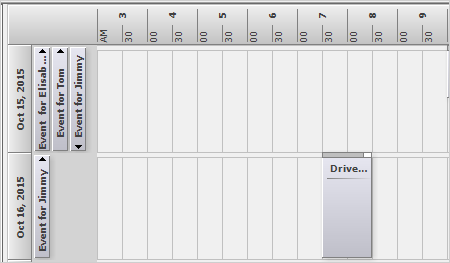 Picture-perfect WinForms schedules in no time at all. 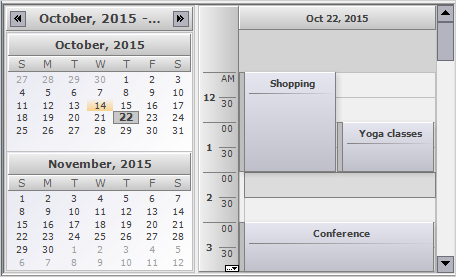 MindFusion is pleased to present you a calendar control that is as feature-rich as it is friendly to use and customize. Engineered to fulfill the most demanding needs of today's business applications and face the highest performance expectations, MindFusion Scheduler is the right choice for your WinForms software. And for you. 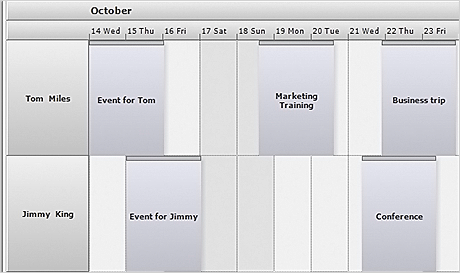 Make full use of the advanced TimeTable view where users can see all planned events, meetings and tasks on a single sheet. Change the orientation of the calendar to get the best possible look. 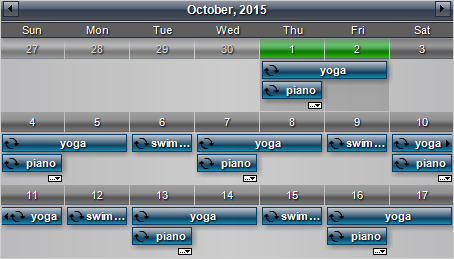 Customize the size of the header and the timeline to enhance the visibility of the timetable. You can easily set the time interval in the cells to a time span of your choice, precise to the second. The built-in Resource view makes it so convenient to list the appointments of multiple people in a single schedule. This way all members of a team get clear presentation of their personal tasks and the tasks of everyone else on the team. The Resource view also offers some compelling treats like grouping of headers, lanes and expandable rows. This practical, comfortable view is really indispensible in large projects where lots of tasks need to get coordinated and employees demand immediate feedback on how everyone else's advancing. 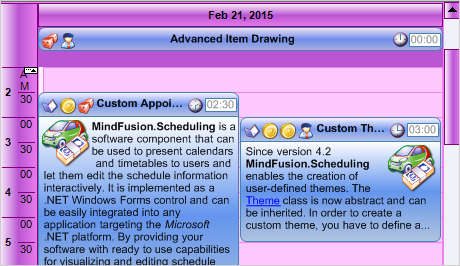 One of the greatest advantages of MindFusion Scheduler for WinForms is its flexibility. Views are exchanged with a single mouse click and it takes literally a second to switch among your daily, monthly or yearly calendar. Add to this the convenience of the dual view where two separate calendars are combined and synchronized to render the perfect timetable, which presents you with a summary of your busy days on one side and a detailed timeline for a given day on the other. Prepare to meet the most customer-driven schedule component on the market. With its long list of customization options you have no doubts the control is engineered to serve you and your development needs. You can start by implementing custom drawing to add a personalized look at your events. Then create your own custom events and apply custom grouping to them. Last but not least come the custom viewers - a compelling way to render appointment data in a WinForms application that knows no limits. Calendars are all about time management and this WinForms Schedule control is optimized to help its users make most of their time. The component offers full support for recurring events. It integrates a recurrence form, where you can easily set every single detail for the recurrent event - time pattern, duration and more. 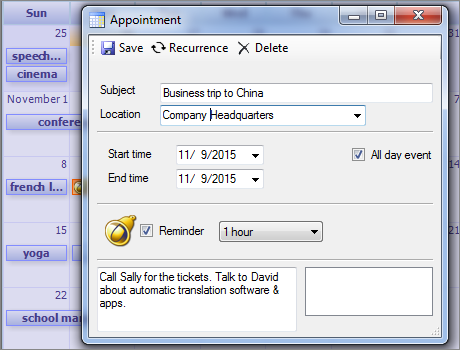 Creating a new appointment or editing an existing one is fast and intuitive with the built-in appointment form. You can add reminders at a time interval of your choice. A modern application not only performs as you demand - it also looks as you wish. MindFuiosn WInForms Scheduler places at your disposal all necessary tools to give your calendars the look and feel of your choice. Every single detail on the schedule can be customized and styled - from the navigation buttons to the formatting of dates and the size of the headers. You can combine multiple timelines, regulate the visible time range and apply a variety of style optimizations like shadows, embellishments, icons and custom editor for events. A set of ready-to-use themes ships with the control and makes the desired look even easier to accomplish. Four types of glass effects and an area effect guarantee your calendar can get the glossy look of today's modern applications should you wish so. Scheduler for WinForms is not only great at presenting static event data to the user - it is also great at responding to user's actions with the appropriate behaviour. Users can select appointments for multiple resources at once. Events can be grouped by a variety of criteria like contacts, tasks, locations and then grouped again to ensure the user is presented with the right data. Milestone items can be added, which transfer important event data upon mouse hover. 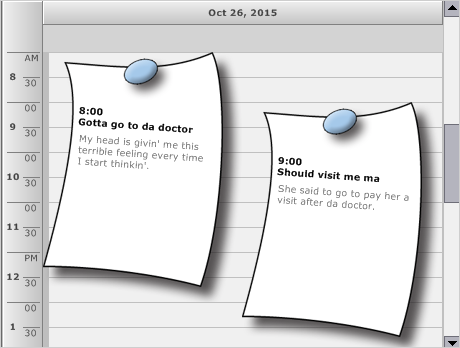 The advanced drag&drop features allow the users to create appointments by placing them at the appropriate time. The options are really endless, what matters are the needs of your application. Let's face it - the calendars are made to keep your appointments. Having that in mind, MindFusion has developed a scheduler control, which is as attentive to your data as it is to the ways to present it. You can choose among several export options - PDF files, XSLX sheets or bitmap images. You can print your schedule and adjust every printing option in the print preview. 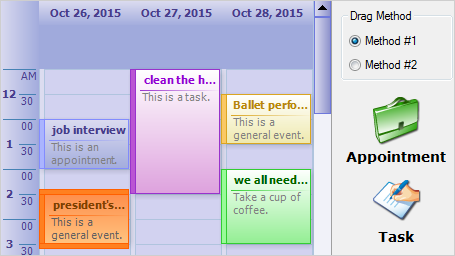 "Planner.NET is great! Completely stable and its feature set is rich. The intuitive design and simple API are far better than any of the competition. I am sure our users shall appreciate the beautiful user interface too. And above all, the MindFusion technical support is fantastic, this is an important reason itself for me to use this control."